The majority of the Morton East students surveyed don’t plan on celebrating Valentine’s Day. According to Wikipedia, Valentine’s Day was originated from a western Christian feast day that honors various saints, one of them being Saint Valentinus. Through decades, many have celebrated Valentine’s Day to demonstrate love and appreciation towards a significant other. Huffington Post says, “The real history of Valentine’s Day is not comprised of roses, chocolates, and pretty cards. Instead, crime, imprisonment and execution are at the genesis of our modern-day love fest, dating back to the man whose martyrdom may have inspired the holiday.” Yet now this holiday is looked upon to celebrate ones love to each other. For 2019, an estimated 135 million Americans are expected to drop $30 billion on Valentine’s Day. In a random survey of 110 Morton East students, 42 students are celebrating Valentine’s Day and 58 aren’t planning to. Our main question: do you celebrate Valentine’s Day? “No, but I’m just going to be with friends,” Junior Justin Chapa said. Although few people won’t celebrate, others will, even if it’s not with a significant other. “I’m not going to be celebrating it with my boyfriend, but I will with my sisters and nephews; I’ve been with my boyfriend for six years, and we’ve only celebrated it twice. And, now, it’s become more of a family celebration,” College and career adviser Ms. Avila said. “I don’t have a Valentine this year; we just broke up, and I did the breaking up, and I’m not upset about it. I love holidays, and any reason to decorate, celebrate with friends, and be happy I’m all for it! And I love the cheap candy after,” school Dean Ms. Radszki said. There’s more to Valentine’s Day other than love and affection. To some, the sweets and decor are their interest after the celebration. “I always go to Walgreen’s for 75% off on the Valentine’s Day candy, especially because the heart is my favorite shape I go all out,” College and career adviser Ms. Avila said. Even those who don’t have a valentine aren’t upset about it. A big plus is the cheap candy the day after. For some, the real holiday is the 15th rather than the 14th. 3 out of the 4 people we interviewed including ourselves are looking forward towards discounted candy on February 15th. There’s a win for everyone. I think this article is very good and it’s true how many people really don’t celebrate Valentine’s Day this year I feel like it’s more . This is a great article with really good back ground, it’s so nice how people make Valentine’s Day about family and friends regardless of not having had a significant other to spend it with. This is a great article and has good quotes. For me, I guess I don’t really celebrate Valentine’s Day but this year it went a bit different and I actually spend it with my friends. We went to my house and just watched movies and ate pizza and ice cream. This is a great article. It is good to know some background information about Valentines Day. 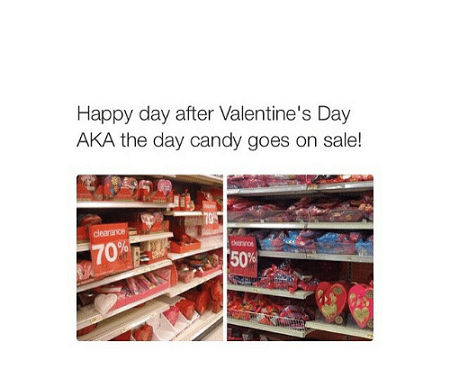 Not everyone celebrates it or not everyone has someone to celebrate it with but the good thing is that the day after valentines day they put all the valentines day candy on sale. I don’t celebrate valentines because I hang out with my friends and every year since are first year at Morton east we went to burger king and got at least more then over 300 or more chicken nuggets and we are still planing on doing this even after high school.